It was an historic day for the Ladies Gaelic Football Association as Marie Hickey was officially inaugurated as the new president of the LGFA. 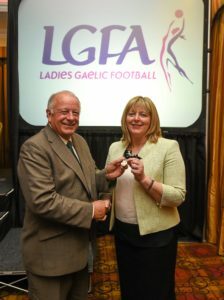 Marie became the 12th president of the LGFA on the final day of the Annual Congress of the Ladies Gaelic Football Association at the Inn at Dromoland in Clare. Pat Quill addressed Congress for the last time as president on Saturday to a standing ovation and the welcome for the incoming president upon her inauguration was equally as enthusiastic. Marie from Ballylinan in Laois had previously served as the President and Vice President of the Leinster Council having also served for 6 years as the Chairperson of the Laois County Board. Marie also held various position in the Laois County Board including Registrar, Fixtures Secretary and was also chairperson and founder member of Ballylinan Ladies GFC in 1983. Marie, a science and maths teacher in St. Kevin’s Community College in Clondalkin, also played for Ballylinan before playing with Crettyard and representing Laois at Junior Intercounty Level as well as representing NUI Maynooth at Third Level. Marie is also an accomplished coach and manager having guided the fortunes of Ballylinan at underage and adult levels as well as coaching the Laois Minors.